Bruce Edwin: And I read that you opened for the Stooges! Bruce Edwin: That amazed me, because I got in to the punk scene at an early age, and what was that like for you? Are you an Iggy fan or what? Alison Sudol: Well, I think I didn't know enough at that time about Iggy, and I was researching like crazy, before we did the show, and was just absolutely like falling over, blown away by him. Alison Sudol: Like, when I was doing the research and stuff, so I think performing on the same bill with him, it meant so much then, but it means even more now, I think as I've gotten a little older, but I was bragging to any body and every body, and I'm not the bragging type, but I was telling every body. Bruce Edwin: Ha, I would too. Alison Sudol: and the Kings of Leon were on that same bill too, it was crazy, but yeah, just watching him up there, blew me away. Bruce Edwin: I bet, I saw an interview with him (and I'm bringing this back, so bear with me), I saw an interview where he said if he could have started out doing more blues or classical type of stuff, he would have done it, but he needed to make money, and rock and roll was a gig he could make money at, and now he's going off in to other areas he originally wanted to do, but it seems like you've got some more, I won't say rock and roll can't be dignified or a high art, because I think it can, or pop music for that matter, but it seems like you've got a lot more intelligence, or academia, or scholarly qualities behind you more than the average rock or pop singer out there, you're name I heard was obviously taken from (a line from) Shakespeare, so, can you tell me about that? Is there an area of study that you are heavily in to and influenced by aside from your music, or what? Alison Sudol: You know, but, I'm not very good at that. Bruce Edwin: That's awesome, that's very wise of you, very cool, you know, as a student of the world per se, with travel, that is an education unto itself, that's great. Alison Sudol: Yeah, that's what I got. Bruce Edwin: Definitely, that's very, very cool. Your songwriting is so highly developed for any one, but particularly for an artist of your time, kind of early in your career, and you've probably been asked this many times, so forgive this, but when did you really start formulating your songwriting? Alison Sudol: And she took me every where, every where! And (she) was not easy on me by any standards (..) You know what I mean? Alison Sudol: Yeah, like literally the first song I wrote by myself on the piano. Alison Sudol: Thanks, it was a start, and it was honest, you know? Bruce Edwin: Yeah. I know, as I'm sure you do, a diverse array of artists or artistically inclined people, and some of them believe that their artistry just comes from them, do you believe in any so-called spiritual inspiration, or element beyond the physical realm that inspires you? Don't miss part two of our exclusive interview with Alison Sudol of A Fine Frenzy in the next issue of The Hollywood Sentinel, out December 1st, 2009. 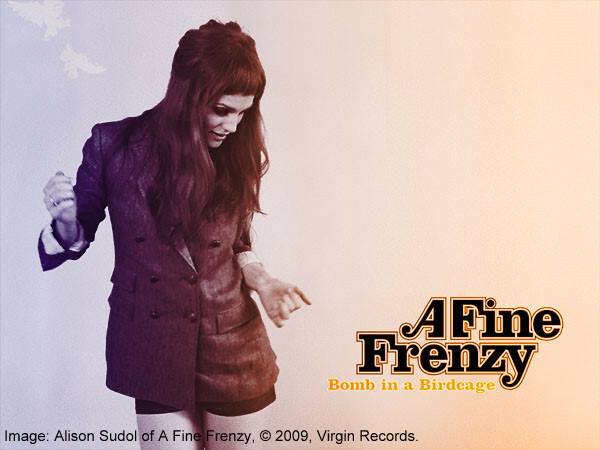 A Fine Frenzy wraps up their nation wide U.S. tour on Tuesday, November 17, in Los Angeles, California at El Rey, and Wednesday, November 18th, in Anaheim, California, at House of Blues. © 2009, The Hollywood Sentinel, All rights reserved.